Property 4: A Li'l Stone Cottage, Charming! Compelling! 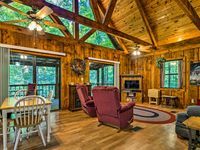 Riverfront Log Cabin on the Ocoee River, Fireplace, Jacuzzi, this is a DIAMOND! Property 13: Riverfront Log Cabin on the Ocoee River, Fireplace, Jacuzzi, this is a DIAMOND! Secluded Tellico Plains Cabin on 25 Private Acres! Property 16: Secluded Tellico Plains Cabin on 25 Private Acres! 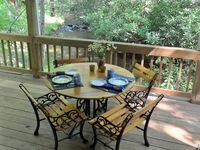 Property 22: "Ocoee River's Edge"
Property 23: Rustic 2BR Hiwassee River Cabin-Near Fly Fishing! Peaceful Reliance Cabin w/Deck on Hiwassee River! Property 27: Peaceful Reliance Cabin w/Deck on Hiwassee River! Modern Rustic Cabin on 5 acres in Cherokee National with amazing mountain Views! My family loved this place! Has everything you need and the setting is perfect. The creek, deck, hot tub, grill...I wouldn&rsquo;t want anything else! Very cozy and very relaxing. Beautiful stream out back. Could hear the water flowing at night. We really enjoyed our stay. A little farther away from anything than we had anticipated. Unless you know the roads around this area wouldn't recommend driving at night. Other than that we really enjoyed ourselves. Spent a day in Gatlinburg, took about 2 hours to get there, but was fun walking around and seeing all the sites.